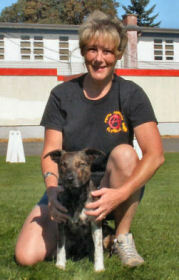 Joanne is our head trainer, and runs on the Division 1 team with Chum. With years of flyball experience and connections all over North America, Joanne is frequently coming up with new training techniques to make our dogs faster and more reliable. Now she is getting her whippet pup Speck ready to race!